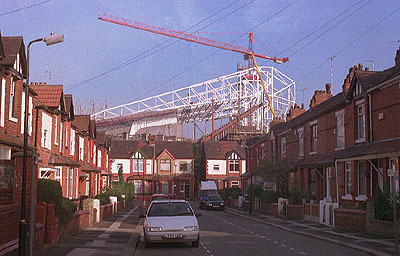 GREETINGS FROM MANCHESTER - CITY OF CONSTRUCTION. I'm up here on the "rooftop of Manchester city centre", the Arndale Car Park, and I'm looking out in the direction of Victoria Station, with Shude Hill below me, the Arndale Centre block to the left and the CIS tower to the right. 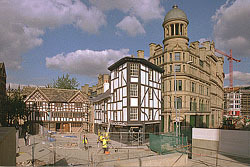 Shude Hill is one of Manchester's oldest streets, but the area behind it is currently being transformed into an ultra-modern leisure and entertainment development. On the corner of Withy Grove and Corporation Street is the giant "Printworks" development - housed in the former Maxwell House building. Not so long ago you could hear the deafening clatter of huge printing presses turning out hundreds of thousands of newspapers. Soon, this building will be an ultra-modern entertainment complex, with shops, restaurants, cinemas, and, for me, most exciting of all, an IMAX cinema. Imax is a special type of cinematographic format which uses double-width film, projecting an on-screen image several storeys high. I've seen it in Bradford at the National Museum for Film Photography and Television, and it's fantastic. 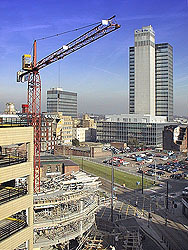 Over to the far left is the Arndale Centre tower. 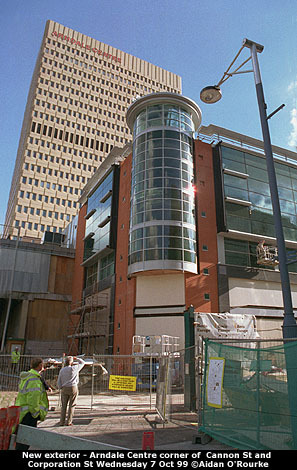 It's now unoccupied, and there were plans to remodel it, but currently, Manchester city centre's ugliest block remains unchanged. To its right is Highland House, former home of the Inland Revenue - now installed in a new building on the Irwell. Highland House is currently being refurbished - the scaffolding is gradually being dismantled revealing a clean, white building, to be used, I think, for apartments. 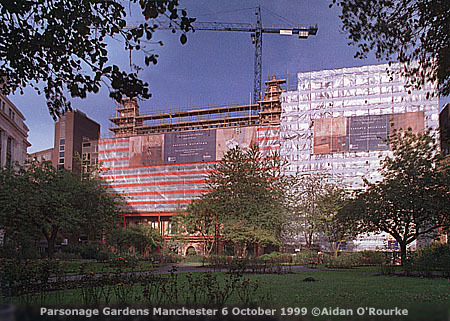 On the far right is Manchester's earliest, tallest, and in my opinion most beautiful skyscraper, the CIS Building, with the similarly-styled but much smaller New Century Hall to its left. Moving over to the other side of the Arndale car park we can get a better view of the new spiral ramp that's being constructed to replace the old one. Straight ahead is the CIS building, and just below it is the site of the proposed transport interchange. The Civic Society have put in an objection to it on account of its design - the model looked similar to the lacklustre Chorlton St Bus Station. On the site we can see some old buildings which are currently disused - one has a gash in the roof after a fire last year. These decaying remnants of old Manchester could be restored, but if the transport interchange goes ahead, they'll have to come down. Moving over to the right, we're looking down Church Street, and here a former commercial building is being converted into apartments it's currently shrouded in scaffolding. Luxury apartments seem to be taking over the city centre - as can be seen here at Century Buildings overlooking Parsonage Gardens. 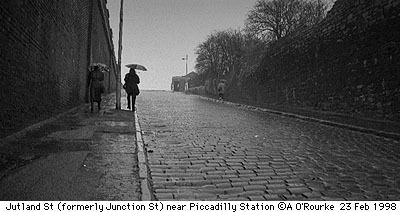 This pleasant spot just off Deansgate - go down by the right hand side of Kendals - is the site of St Mary's Church, demolished nearly 100 years ago. Up till last year these were offices, but the word processors, desks, chairs and filing cabinets have been removed, soon to be replaced by Conran-style sofas, coffee tables, fitted kitchens and tellies and personal computers. But designer-style city living won't come cheap - starting prices for a one-bedroom apartment in a top city centre development appear to be round £70,000 or £80,000. One apartment that takes my fancy, the penthouse on the top floor of the Hacienda rotunda, will cost over a third of a million. I'll just have to keep saving my pennies. 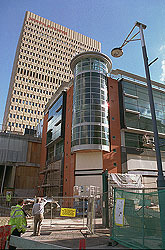 Walking down Deansgate we reach another leisure and entertainment complex housed in a former commercial building. 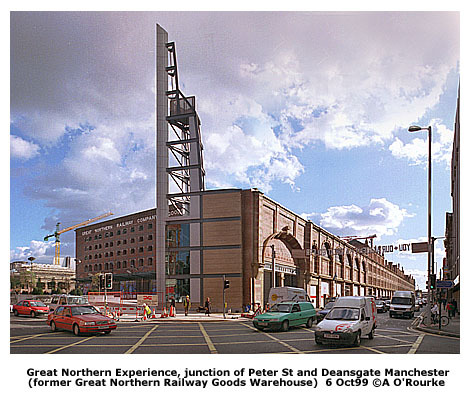 It's the "Great Northern Experience", named after the Great Northern Railway Goods Warehouse. For over a century this magnificent brick-built edifice resounded to the clank-clank of railway carriages and the huffing and puffing of steam engines. After closure, its lower levels were used as a car park, with a dismal entrance at the top end, overlooked by a run-down row of buildings at the bottom of Peter St.
Now, this has all gone, and in its place is a recently-completed piazza, with a grassed outdoor amphitheatre, and towering corner-piece shaped like a giant razor. The brick edifice remains intact, complete with the giant lettering put up during the golden age of rail. 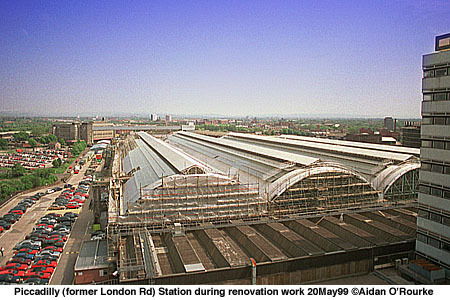 At the other end of the warehouse, the cast-iron supports which held up the former railway marshalling yard were recently dismantled and removed. Reinforced concrete pillars are starting to grow like a giant forest - soon to be clothed in a mantle of glass and steel. Inside you'll be able to enjoy a host of different entertainments, inluding what's described as Manchester's premier ccinema, as well as shops and restaurants. Across the street, next to G-Mex, once Central Station, the Manchester Convention Centre is starting to appear. 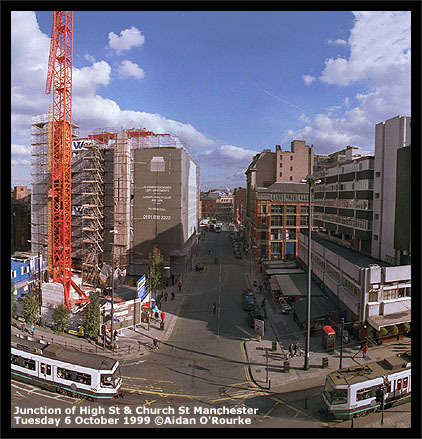 So MANCHESTER IS CHANGING and changing fast, but what of the old Manchester? 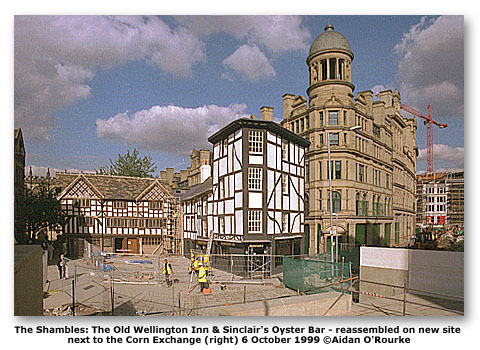 Well, the two final remaining bits of medieval Manchester have been reassembled on a new location next to the Corn Exchange - The Old Wellington Inn and Sinclair's Oyster Bar are looking quite attractive and very spruced up in their new home - though I'm not keen at all on the contemporary style buff-coloured stone-clad bit that links the two parts, now arranged in an L-formation. Another contentious feature is the row of palm trees which have yet to be installed - originally to have been real palm trees until someone realised that this species wouldn't be able to survive the northern English climate. They then decided to use metal ones. Why do we have to have palm trees at all? If I want palm trees I'll go to Miami, this is Manchester. The exterior re-cladding of the Arndale Centre is well underway - look at those corner pieces (left) - I think they're quite attractive - and a vast improvement on the yellow tiles. Next door, the Marks & Spencer building is nearing completion, but on the other side of New Cathedral Street, another part of the 70's development is meeting its demise. I spent an entertaining twenty minutes sitting at the window of the second-floor Paperchase coffee bar watching a dinosaur-like digger gnawing and nibbling at the building - tearing away bits of reinforced concrete, remains of air ducts, floors walls and stairways, slowly razing the ugly concrete monstrosity to the ground. It's almost as good as "Walking with Dinosaurs", currently attracting huge audiences on BBC1. Talking of things from the past, let's not forget that on this spot stood the magnificent Victoria Buildings, similar to the Barton Arcade, but bigger. Sadly it was hit by incendiary bombs during the Blitz and was later demolished. 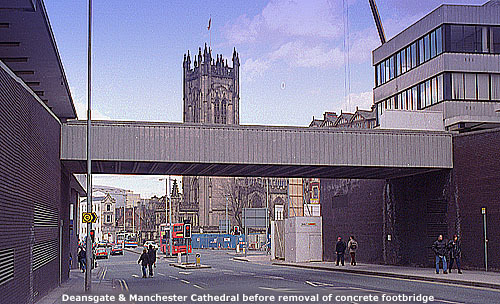 As a child I remember the pleasant triangle of green which used to be here at the bottom of Market St and Deansgate. 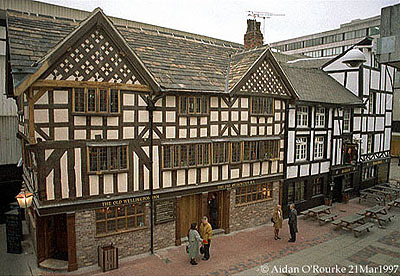 The old Shambles stood on the eastern side, it was nice. Then, in the late sixties, the developers moved in, raised the Shambles up on stilts and all around it, built the characterless white concrete environment which I'm sure looked fine on the drawing board, but lousy in real life. Now it's being demolished. 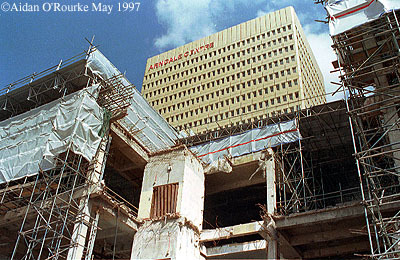 I wonder if the buildings being constructed today will be torn down again in thirty years. Seems unthinkable, but so was the bomb. I must say one thing: I wish they'd leave this space empty, but no, this area will soon be built on again - let's hope what replaces it is better than what's being torn down. Talking of vacant spaces, the Council are still planning to build an office block on Piccadilly Gardens. Read about it on my Piccadilly Newsletter, published some weeks back. And here's another visualisation I've done, using a building taken from elsewhere and pasted onto the picture - the reflection in the window gives the game away, but it's not bad. 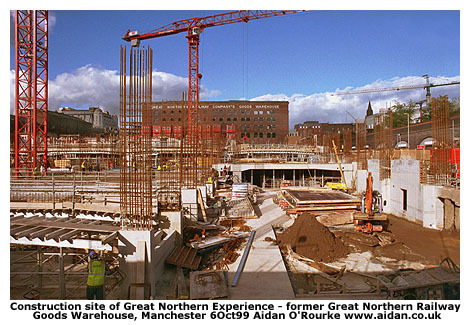 Yes, Manchester certainly is boom town at the moment, at least from the point of view of building and construction. 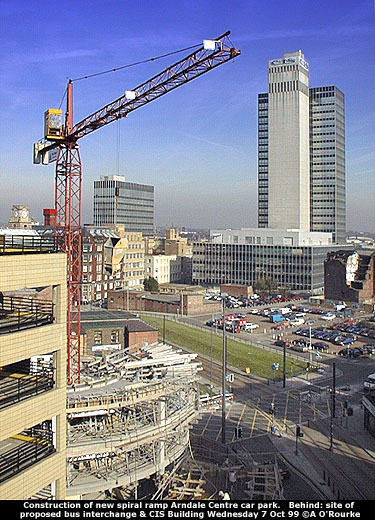 I think it was Graham Stringer, the north Manchester MP and former Council Leader who said you could tell how well the economy of the city is doing by the number of cranes visible on the skyline. By that reckoning, Manchester is doing very well indeed, but does a whole lot of construction necessarily lead to a city that's a whole lot better? 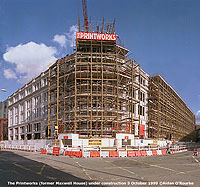 The Gateway Centre - a new-style shopping complex in its early stages of construction at the bottom of Cheetham Hill Road. The City Art Gallery currently being extended - the new gallery will feature lots more exhibition space. The Grand Hotel apartment complex nearly finished on Aytoun Street - lots of plush new pads, I know someone who's moving in there soon. At the other end of the complex, facing onto London Road, is a multi-storey car park that looks to me like a giant fan-heater. Piccadilly Station - renovation of the train shed is now almost complete - soon work will start on a new concourse - Please, Railtrack, can we have a very big concourse, the present one isn't on a scale befitting the importance of Manchester..
Next to Jutland St, on the site of my gloomy photo taken two years ago, another complex of apartments is under construction They'll face onto the canal and I'm sure will be nice, but shame that the old right hand wall of Jutland St had to be destroyed. On Cambridge St, old mills are being converted into apartments - the chimney is being kept, thank goodness - chimneys used to be such a strong feature of the Manchester skyine and most are now gone. Next to the Brigewater Canal, the Bridgewater Bank apartment complex mostly complete and occupied. They look superb, especially reflected in the water in the early evening light. Further down the canal on Whitworth St West, a unique construction project is well advanced - old arches under the former Central Station will become cafe-bars and restaurants - they'll be made accessible from the street via boardwalks suspended above the canal. 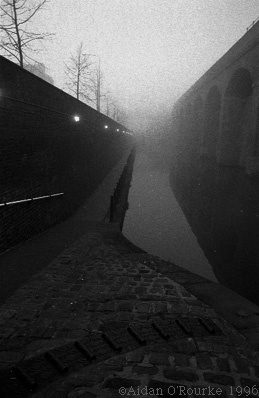 I wasn't sure when I saw this first - this is where I took one of my first moody fog-bound black and white view (above right), but looking at how it's shaping up, I'm impressed. It reminds me of a conversion in the main station in Leipzig Germany (feature coming shortly)- totally different setting but similar layout. Other projects further out of the centre include the new hospital block at Wythenshawe, the Commonwealth Games site in Beswick - still in its early stages, the Commonwealth Swimming Pool complex on Oxford Road, new apartments and houses in Hulme (by the way, the Birley Tree was cut down in the early hours by a team from Manchester City Council) new apartments on the site of the Capitol Theatre Didsbury, a new extension to the Central Mosque in Victoria Park, the Second Runway at Manchester Airport - a new stand at Old Trafford and across the water in Salford Quays, the Lowry Centre, looking ever shinier and more high-tech as each day progresses. THE LOWRY is what I should be calling it, and here I have a comment to make: Somehow, I don't think that the awkward, eccentric and brilliant painter whose name has been used as the title for this superb new arts centre, would have appreciated this honour. Someone who interviewed him told me that LS Lowry's response would probably have been: "All they ever wanted me for was my name - no-one was ever interested in me". If this is how he would have reacted - then they should have chosen some other name for it. And will people say "I'm going to the Lowry to see King Lear"?, or will they say "I'm going to the Lowry Centre" We'll have to wait and see. People will be able to view the largest collection of Mr Lowry's paintings and drawings in this high tech environment - somehow I think a converted old mill would have been a more appropriate setting. AND NOT CONTENT with naming their flagship 21st century arts centre after an artist who painted industrial scenes with a heavy atmosphere of the 19th century, Salford City Council have put his name on their breezy new sign, which you'll encounter on roadsides along the city boundary. Looking at this sign, it looks as if the designers are trying to challenge our preconceptions about Salford by using imagery which has absolutely nothing to do with the place and its history. The message I get from this sign is: "Salford has no character". 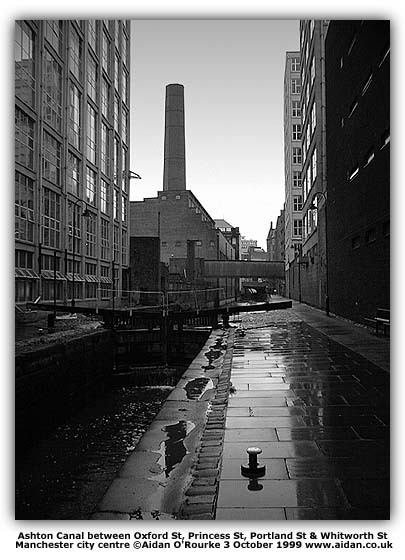 It would be suitable, I think, for a new town, but Salford has a past as well as a future. 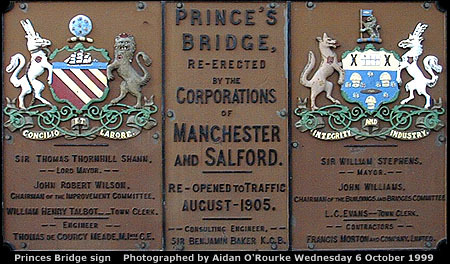 By comparison, here's the old sign on Prince's Bridge, put up nearly 100 years ago. No PR considerations in those days, just the names of civic dignitaries, and the coats of arms of the two cities, all completed in robust cast iron. 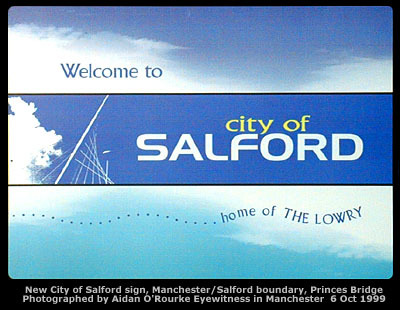 I wonder if the new Salford sign will still be around in a hundred years. 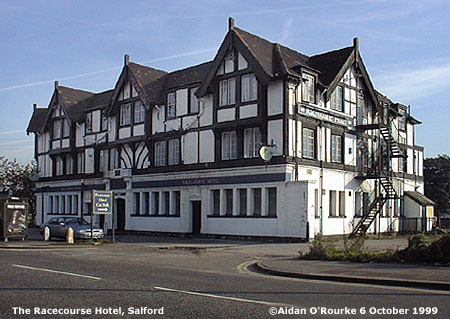 WHILE THE CONTEMPORARY face of Salford is turned towards the future, many historic areas are suffering neglect or are under threat - the Racecourse Hotel, fondly remembered by many who attended the Races at Castle Irwell, is currently looking run-down and in need of repair. 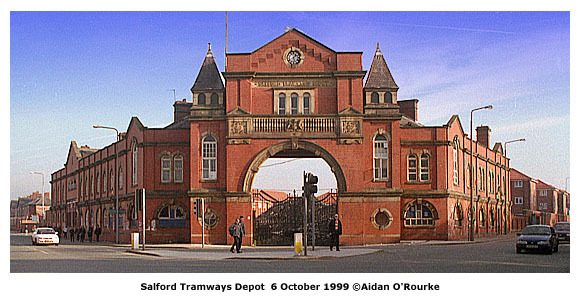 The Salford Tramways building has had an uncertain future for quite some time. 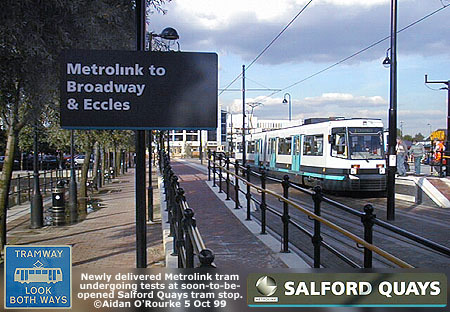 Still, talking of tramways, the Salford Quays/Eccles Metrolink line is nearing completion - on Tuesday I saw engineers testing a brand new tram at the new Salford Quays tram stop (right). LET'S RETURN TO OUR STARTING POINT, here on the roof of the Arndale Centre - with building work continuing all around - the sound of pile-drivers, cranes and drills - a new Manchester is in the making, let's hope the present redeveopment lasts longer and creates a better environment than that undertaken a generation ago. THE SUN IS OUT TODAY, and the sky is as blue as on the Salford sign. It's been changeable of late. Good weather is forecast for the weekend. I'm off for full English breakfast at Littlewoods department store in the base of the Arndale Centre - Only a couple of pounds for bacon, eggs, black pudding & more plus a free newspaper.